As you can hear (if you put your speaker ON), I've got a new music player installed on this blog. It's Top 6 of my current favs and personally when I have my blog on, I like the music playing in the background. But obviously it may not be the same for others, so I've created a poll to see whether I should keep this going. Take the poll now - it is only open for 7 days! 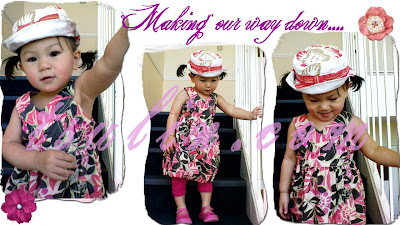 24 June 2009 : She turns 2 today! Over the weekend we had a small "family" celebration with SIL Alicia at a restaurant in the city. But on the actual day, which was yesterday, I decided to bake her a flourless Chocolate Cloud Cake after accidentally stumbling upon a photo of one that Soo Yin has baked. 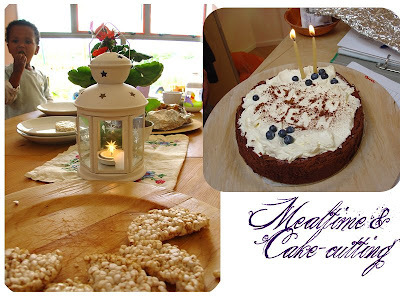 She made it looked SO tantalising & beautiful I thought I should check out the recipe. True enough, it wasn't too difficult to make. I had a trial session with my friend Michelle the Friday before and it turned out pretty good. 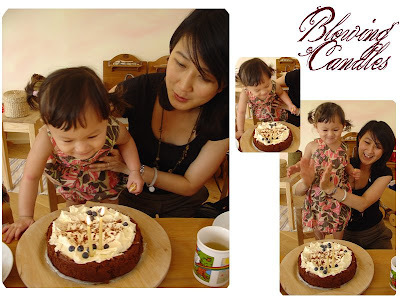 So on Tue afternoon (23 June), I started to bake the cake for her. I have also been given some really helpful and interesting idea by Mich for how to decorate it (With her name). It smelt absolutely good when it was out of the oven. Then after cooling it down, I put it into the fridge & at night (it was 1am!) I did some cut-out of Shean Wenn's name. 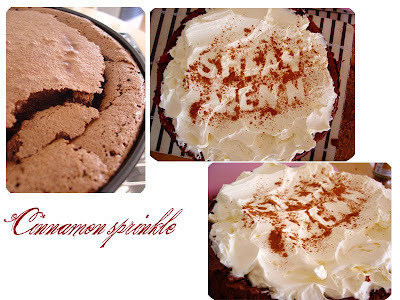 In the morning, I made the whip cream to be put on top and lay out her name on the whipped cream before sprinkling some Cinnamon powder so that her name appears on the cloud. I realised some of the alphabets didn't appear very well, but it's ok.. it's the imperfections that make it perfect! ;) I then added some blueberries on top. 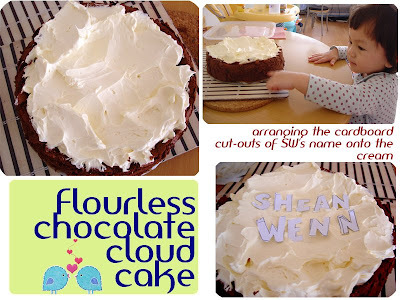 Chocolate Cloud Cake for a TWO year-old! Everyone in the playgroup said it looked stunning! I told them that it was my 2nd time baking and I think I can sense some hesitation from them to try. HAHAHA!!! Anyway during mealtime, Katie the centre manager brought out the cake singing a birthday song (it was a Steiner-style song and I don't remember the words now). Katie put on 2 beeswax candle on it, it looked quite amazing, doesn't it? 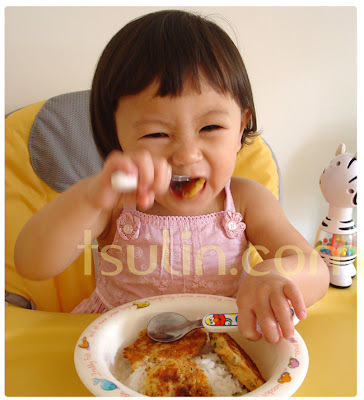 Shean Wenn was so delirious & excited when the cake was put infront of her. She has also been anticipating blowing out the candles. She knows it's her cake (because I told her so)! Look how excited she is! Anyway, the cake received very good response. Infact "good" is an understatement (Ceh, self-praise). :P Comments were that it was just "SO RIGHT" - not too sweet, just the right texture & rich-ness and the cream that accompany the dark chocolate cake was just the right complement. One of the mom, Anna also loved the hint of cinnamon powder. I guess the cinnamon powder is an acquired taste, some people don't like the smell & taste of cinnamon powder. Needless to say, I felt very proud & happy that it went so well. 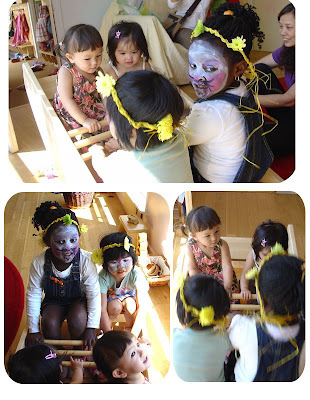 The day also coincided with the kindergarten's Summer Fete! Like last year's, there were booths selling food & arts & crafts & some other products. This year there are also face-painting but I chose to remian indoors most of the time because it was just too hot out here - felt it I was being baked. Also, I didn't bring our sunblock along and eventhough Laura, a friend of mine handed me her tube, I only put on for SW and not myself. The kids happily playing indoors! Four kids in a rocking boat - Faith, Joyee, Kayee & Shean Wenn! 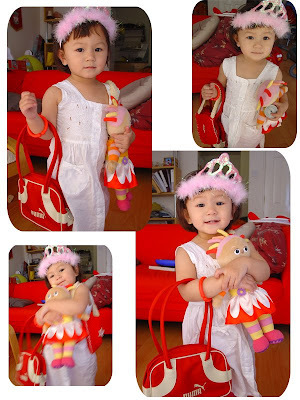 Shean Wenn this morning in a dress my mom bought for her, holding onto her new bags, her Upsy-Daisy talking plush (gift from her paternal grandparents) & tiara that SIL Daphne got for her. No, I did not make her wear those, she put on the ensemble by herself (I helped her with the dress, of course because she was struggling to put on the buttons and was crying out for help!). Isn't she turning into such a girly-girl? Michelle : For patiently guiding me the 1st time, and also for her equipments she loaned me (Electrical Whisk & Weighing Scale). About a month ago, I accidentally stumbled upon SW's new skills. She can draw a face! Complete with 2 eyes, a nose & a mouth - all at the right places. At the same time, on her own initiative, drew a pair of ears at both sides of the head! What I did was, I drew an oval/round-shaped "head", and she proceeded to draw the other features. Then, after drawing the eyes, nose, mouth & ears, she told me she wants to draw legs, and the legs started just below the chin! Oh, of course to me that was the most beautiful painting/portrait. A MASTERPIECE! Today I woke up to her drawing on her Aquadraw Mat and I video-taped her drawing another face. Shean Wenn doing another masterpiece. I had a go at Phoenix and because I use Photoshop, Phoenix felt alot like Photoshop Elements, which is good of course. Especially since the licence for it isn't cheap at all! I didn't have much time to explore more, but from first glance the interface looks exactly like that of PS Elements. The "layers" & "history" buttons are located on the right side and the tools buttons are on the left having all the basic "tool" funcstions such as "Magic Wand", "paintbrush", "text tool" and the likes. And if I have even more I'm sure I'd find navigating & ease of use as as easy to work on as Photoshop Elements. I guess at this point for me, the downside is that it cannot be used offline - which means you need a relatively fast internet speed to do your work online. Of course having the software offline would probably defeat the whole purpose of it being a web-based software anyway. Am i making any sense? So what exactly is all this bird talk?? In their FAQ section and when asked what exactly is their mission, they say shortly but sweetly " (To) Make the world's creation accessible." I think the 5 words really do make the sentence powerful - accessible (not forgetting free) and to be able to use it for any creative work. Our motto was "Creation on the fly" and the bird metaphor seemed the best choice out of all the options available to us. We didn't want to name our software after bugs (for obvious reasons). Also, haven't you heard? The bird is the word. (And they attached a clip from "Family Guy" hilarious!). You can check out their FAQ here. Anyway, a good tool for someone who has an internet connection and who needs to use an image-editing software but doesn't want to spend money on buying a licence for it. So flock (Oh i can't help the pun!) there if you think this is for you! The past few weeks were hectic for me : studying for the "Life in UK" test for application of the UK Permanent Residency & while in the midst of studying, I have also discovered a highly addictive FB game as a destress regime- "Bejeweled Blitz" (BJB). For days, I will be playing BJB whenever I can find the time amongst studying, housekeeping, housework & caring for baby. Well, all games are addictive but this is highly addictive because on the right of the screen, you get a scoreboard with your friend's highscores updated LIVE. So everytime I play, my goal was to GET TO THE TOP! Anyway, because I am quite fed-up with eating almost the same food every week, I thought I should bring out my trusty recipe book, an aptly titled "Hawker's Fair Simplified" (which is basically depicting all the delish hawker food of Malaysia) and looked at which recipe I should try. I decided on the "Nam Yee Spare Ribs" (Name Yee = fermented red bean curds). We usually buy streaky pork so I used streaky pork instead of spare ribs. The hubs's feedback was SO good that he requested for it 2 days later. 1. Combine pork with marinade & marinade for 3 hours. 2. Heat up oil for deep/shallow fry, put in pork and fry until golden brown & cooked. 3. Dish & drain. Serve. 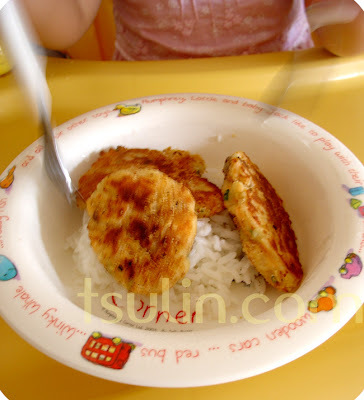 And today for lunch, I decided to make some salmon fish cakes/patties for Shean Wenn since I think she's probably quite sick of eating the same kind of food every week. This is a recipe I got from my friend MZ who is a nanny to 2 M'sian kids. I modified it as well. Egg : separate yolk from white. Both will be used. 1. Boil the cubed potatoes until cooked. Drain & mash with butter. 2. Add some olive oil in pan and pan fry salmon until cooked. 3. Squeeze some lemon juice onto the salmon. Use a fork to mash up the salmon with the egg yolk. 4. Mix the potatoes & salmon together. 5. Add in diced shallots, cheese, carrots, some salt & pepper to taste. Also add in coriander. 6. Pour in the egg white. Mix in about Corn Flour & Plain Flour (add in gradually to adjust to the egg consistency). 7. Make sure the consistency is not too "watery". Scoop up a spoonful using a tbsp and coat with some bread crumbs mix with a little cornflour. 8. Heat up some olive oil in a pan. 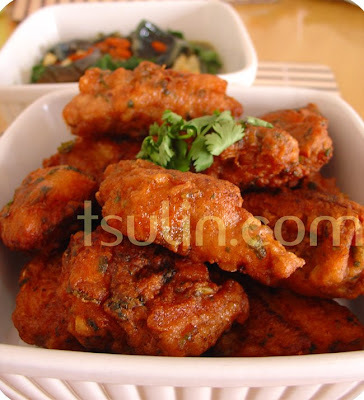 Pan fry the Fish Cakes/Patty until brown & cooked. She takes a big bite into the Salmon Patty! YUMMOS! She polished up everything! On 1st June, I made my way down to the park with SW. I had looked at the weather forecast and knew that today & tomorrow (2 June) were the only days with brilliant spell of sunshine & high temperature (mid-20's) this week. I slapped on sunscreen for the both of us, brought some essentials down (some toys, water, baby wipes , etc) and headed to the park. 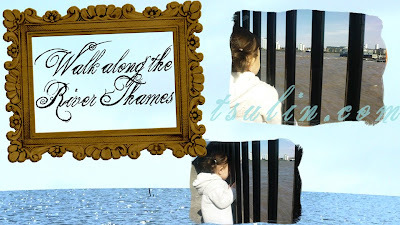 The walk to the park can be interesting if I bring her along the "longer" route, via the pathway next to the Thames River - she likes to glance and tell me what she sees on the way. For example "Momma, ants! ", "Boat", "Bird chirp chirp, fly!" (she will also clasp her mouth and laugh when she says certain things **rolls eyes** - she certainly is a very chatty & happy toddler). However, on that day, we didn't go the long route. I arrived and met my friend - a nanny to two gorgeous girls (their parents are Malaysians). 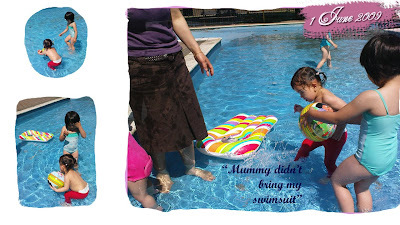 MZ was there and she was all prepared, ie the kids were donned in swimming suits and playing happily in the shallow pool there. Now, I don't usually allow SW to go into the pool because it always looked a little dirty to me. But that day I had a better look. They changed the water everyday and since it was early part of the day (around 11am), the pool's water was still very clean and only another 3 or 4 other kids were playing along.. SW pleaded to me to let her in. Actually she had been pestering me to bring her "swim swim" for the past week - I kept hearing "Momma, go outside swim!!" (Yes, she manages to speak in sentences now. Very very interesting.) I thought "Why not! Don't be such a spoil-sport". Needless to say, she happily went in and played in the water and an hour later, I had to drag her out kicking and screaming. Ok, maybe not kicking but she was not very pleased. I had to reason with her that she needs to eat lunch and drink some water, besides, KaYee & JoYee (her friends) are already dressed. SW agreed. 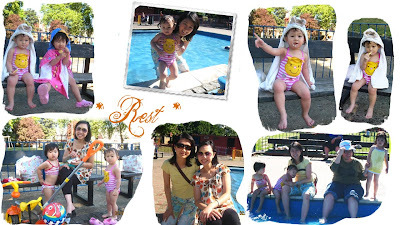 We had so much fun that the next day I made plans to go to another nearby park with Mich & Kaka. But 20mins before we left the house, Jessica called and told me she's in the park next to our place so we all headed there again. The three kids : SW, Kaka & Xin Yi splashed about for almost 2 hours (stopping for rest-breaks a few times). I think SW enjoyed it the most, she seems to be the one in the pool longest. Always finding something to do or be happy about. Jessica commented that SW is really such a waterbaby! She is right. I am now looking for swimming classes to bring her to. The local leisure centres usually have this "Aquatots" classes for baby & parent. 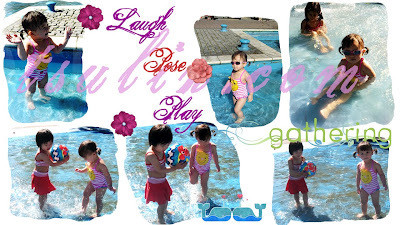 For kids below 4, you need to accompany your child and since I love swimming myself, I really look forward to this. Hope I can book us a slot. Oh, and I cut my hair the week before. Nice? It feels lighter, that's for sure. And shampooing these days takes just 10secs. Best is no more tangled hair. Today is Shean Wenn's lunar birthday! She is THREE in the chinese calendar. I made two hard boiled eggs for her to peel as a symbolic gesture. Happy Lunar Birthday, my dear darling baby! It's been a blessing to be able to stay at home and take care of you, and see how you have grown, from a day old to who you are today! On another note, my cousin Sandra, together with her good friend Mak cycled to the 4 corners of Malaysia in 37 days! What an amazing experience. Her blog details her experience pre, during & post adventure and there was a write-up on their experience in The Star as well! Who can boasts that they have travelled their own country so extensively? Not many, I would presume.